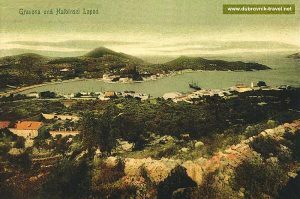 Lapad is a large peninsula (not an island ! as some websites claim) situated just outside of Dubrovnik’s Old Town, on its Western side (check its location on the map). 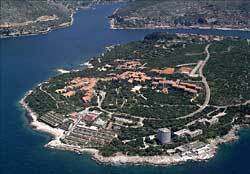 The distance to the airport is about 22 kilometres (14 miles approx) and to the Old Town is about 4 km (2.5 miles). To reach the peninsula from the Old City you can take a bus from Pile Station – Libertas bus number 2, number 6 or 4 (see a map of public transport). The ride takes anything between 10 to 20 minutes, depending on the area of the suburb you are going to. See more details here. If you are going to Lapad from any other area including from Gruž, where main bus station and ferry terminal is located, you can take any bus line to Batala and then change to no 2 or no 6 to proceed further to your destination. If you plan to do a day trip to Mljet while staying here, you can easily reach Mljet National Park by ferry from Gruz port which is just a short bus ride from here. 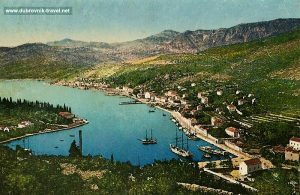 Same applies if you plan to visit Hvar or any other island – it is very easy to get to the right point of departure from any location on the peninsula (see public transport page). 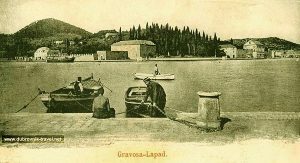 There are some areas in Lapad (like Batala or Montovjerna) that are much closer than others so they can be easily reached by foot from either Gruž or Dubrovnik Old Town (15-20 minutes walk). If your accommodation is in Lapad and you need to get there from the Airport, the best option is to take a bus to the Old town and get another bus (no 4 or no 6) to your destination. You can also use taxi or Uber. 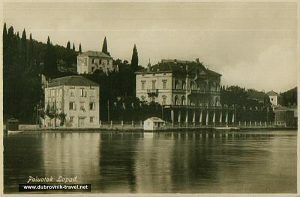 Lapad is relatively new part of Dubrovnik, not as old as Dubrovnik’s Old Town. The houses and block of flats around here were mostly built in late 1960’s and 1970s and around the same time, several new hotels were also constructed, the latest ones are in Babin Kuk area. Previously, before the 1930s, there were just a couple of villas here (see Villa Eliza photo below) that were owned by local merchants and nobility. From the beginning of 20th century, some of the local businessmen started with constructions of small, family-run hotels, that were and are still situated in the Uvala bay, in the near vicinity of the beach. See some photos here. If you are wondering what name ‘Lapad’ means, here is an explanation of its root and meaning: The root of the word is lapis, lapidis which in the Latin language means stone, rock or jewel. In the old times, the peninsula was named after rocks due to its distinguished shape and rocky seashore (see here how it looks). 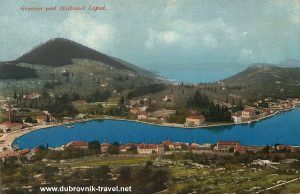 Most of Dubrovnik Hotels are located here – around the area of Uvala Lapad (Bay of Lapad) or on Babin Kuk – the area around peninsula’s western edge where large beach Copacabana is situated. There are also numerous houses here that rent rooms and apartments. You can easily find a very good accommodation around this area for a fraction of the prize of the Old Town accommodation. The prices are higher for apartments near the beaches (Solitudo, Uvala, Orsan area) and are a bit cheaper in the blocks of flats in the centre of the peninsula. If you would like to support this site, please book your hotel via this link. Copacabana, Cava and Uvala Bay are three main beaches which are particularly suitable for small children or people who like to have all beach facilities available right there. Some parts of these beaches are sandy while the rest is just pebbly and rocky. However, if you are not keen to pay the entrance fee, there are plenty of other places around here to swim, sunbathe or snorkel. Neptun (part of the coastal path just off Nika i Meda Pucica Street). The seashore here is predominantly rocky with numerous large slabs that are great to lay on or jump from into the water. Some pebbly and sandy patches can also be found but tent to get reserved from the early mornings so don’t count on it. Note: In July and August, if you are not staying in Lapad, you can get from several points in the town to any of above swimming spots by mini vaporeto ferry service. By the same service, you can also go from Lapad to Lokrum.